If you want to be able to grill up some fabulous food in your backyard for your family and friends (or even just for yourself), you need a great grill. 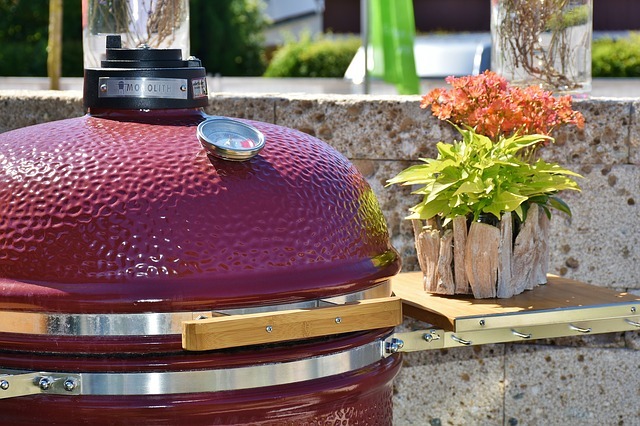 If you’re looking for reviews of the best gas grills 2019 has to offer, we’ve got you covered. 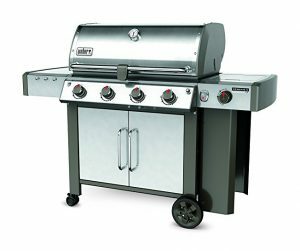 There are many gas grills out there with a huge variety of features. 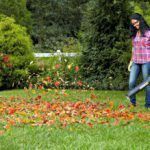 Picking out the right one for you can be a bit of a challenge, so let’s take a very quick look at what you need to know before you buy. 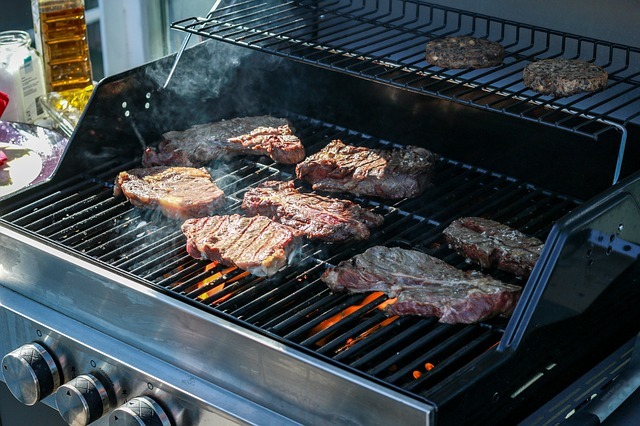 The very first thing you’ll need to do is to determine which type of gas source you’ll be using to fuel your gas grill: Natural Gas (NG) which requires a hook up on your patio, or Liquid Propane (LP), which means you’ll be fueling your grill with propane from a tank. The answer to this question will narrow down your choices. Many of the best gas grills on our list do come in either Natural Gas or Liquid Propane models, but not all! 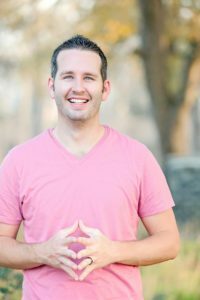 Are Flavorizer bars important to you? These flame-taming systems that sit between the burner’s flame and the grill reduce flare-ups, protect the burners, and convert drippings into flavor-infusing smoke. Not all grills come with flame tamers, although many in this list do. Obviously, basic models with no frills are easier on the budget. They can still do a fantastic grilling job, but sometimes some of the extras are worth paying for to make your grilling experience even better. 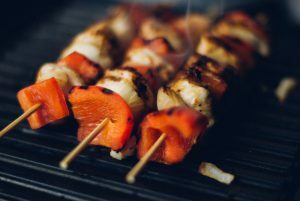 Here’s a short-list of some of the extras available on some of the best gas grills 2019. This is a lengthy post… we’ll be covering, in depth, many of the best gas grills 2019 has to offer so far. 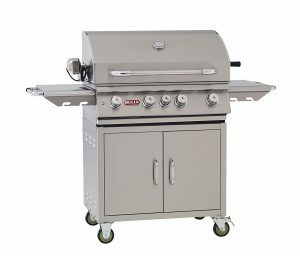 They are the gas grills with the best price, best quality, and best performance, based on customer ratings, popularity, and reviews from multiple online shopping sites. Click HERE to see the above chart in expanded form, including more product specs and features. Besides the fact that this grill has a perfect customer rating so far, we think this grill offers FANTASTIC bang for your buck! The Napoleon T410SBNK 3-burner grill is quite simply, an excellent entry-level natural gas grill. With this grill, Napoleon focused on making a product that does the basics REALLY well: Grilling! It doesn’t have all of the fancy bells and whistles that many people don’t really care about, and because of that, it comes with a price tag that will make most people pretty excited. Other than the painted porcelain hood, and the grill grates, which are made of porcelainized cast iron, the whole grill is made of quality stainless steel. This Napoleon is a basic (yet very good quality) gas grill – it’s does a great job at exactly what it’s supposed to do: grill your food. It does not have all of the fancy extras, but then again, you aren’t paying for them either! We think you’ll be more than satisfied with this grill if you’re looking for an entry-level model that fits nicely on a smaller patio. 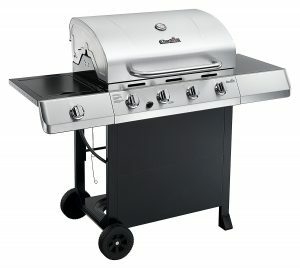 This awesome natural gas grill is size-wise similar to the first grill, but it comes with a few extra treats for you! The Weber Genesis S340 is one of the best mid-priced grills out there right now. This grill is one of the “Best Value” winners for 2018! Weber is known for it’s high quality gas grills. This one is no exception. You can order the grill in black painted steel (hood and frame) or stainless steel, but the majority of either design is quality stainless steel, including the grill grates (7mm), 3 burners, and Flavorizer bars! 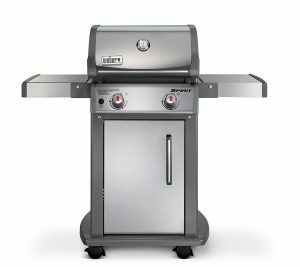 Weber’ GS4 High Performance Grilling System: Infinity Ignition, High Performance Burners, Flavorizer Bars, Grease Management System – put them all together and you have a grill that lights every time, cooks smoke-infused delicious meals evenly and consistently, and makes clean up a snap! The GS4 also lengthens the life of your grill, as the drippings that are not vaporized by the Flavorizer Bars are funnelled away before hitting the burners! It’s iGrill3 ready – you can (purchase and) download the iGrill 3 app – a Bluetooth digital thermometer that actually monitors your food from beginning to end, giving you real-time temperature and even the fuel tank level on your mobile device. This grill is definitely one of the best value grills you can find. Take a look at this video for a quick 3D peek at the grill! This is one of the top high end natural gas grills on the market. You CAN find even bigger, pricier models, but this amazing grill by Bull Outdoor Products is an awesome option for you if you’re a serious back patio griller who want some of the fancy extras and a grill that cooks food that’ll knock the socks off your guests. 16 gauge, 304 stainless steel construction throughout! This is the SERIOUS quality stainless steel – the thickest used in the grill industry – making it extremely resistant to corrosion and rust. The cooking area is an impressive 810 sq inches, with an additional 210 sq inch warming rack – you can cook up a huge feast all at once! Lifetime warranty on the grates and firebox, and 20 year warranty on the 4 cast stainless steel burners! The Bull Outdoor Products Angus Grill is one powerful and impressive grill! It does come with a nice price tag, but if you can afford it, this will likely be the last grill you purchase for a few decades, if not ever! For those of you wanting just a basic backyard grill for under $200, but one that is excellent value for each of those dollars, this one is a great option for you! It has space enough (405 sq inches) to cook a feast for your hungry crowd, a large warming rack that folds away if you don’t need it, and 4 burners so you can do that fancy “indirect grilling” to your hearts content. 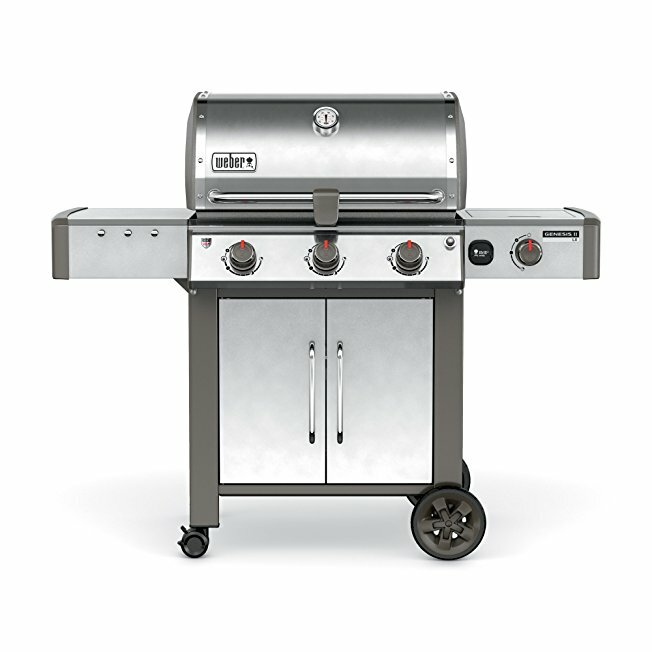 It’s sturdy, uses the standard size of propane tanks (20lb – and yes, there is a tank support bracket and hanger behind the grill so the tank doesn’t just hang dangerously). Lid and firebox is made of porcelain coated steel, which is durable and weather resistant – great for those of us who sometimes forget it cover it up after using it. 4 stainless steel burners – stainless steel is one of the most durable materials for burners, PLUS you can control high and low heat much better with SS. Push button ignition (Piezo system) makes it easy to start up your grill with just one finger! 2 wheels that make it easy to move your grill to wherever your party is gathered, or even to move it to storage for a season, should you live where grilling year ’round isn’t so attractive. Two decent sized side metal prep shelves (approx. 12″ x 13″) – you’ll love having those shelves for sauces, plates, utensils, timers, etc. Overall, this grill is rated 4th based on the high reviews… the low price is a bonus! If you’re looking for a cheap, basic propane gas grill that’ll last a few years – check this one out! We don’t think you’ll be sorry! 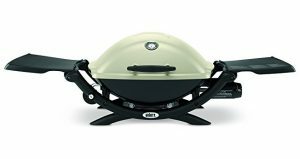 Another high rated entry by Char-Broil in our Best Gas Grills 2018 list is this 2-burner liquid propane grill. It’s also under $200, and packs a lot of great grilling into a space efficient model! This grill would be a great fit for those of you with a small area on your patio or deck for grilling, as it has a small footprint (43″ W x 24.5″ D x 44″H). When you aren’t using it, you can also fold down the side shelves, reducing its size even more! This grill has some great features! The storage cabinet keeps the (not exactly attractive) propane tanks nicely out of sight. There are 4 wheels (2 of which lock) to let you very easily move the grill wherever it needs to go. It has a removable porcelain coated grease pan for easy clean up! You can say goodbye to tin foil trays! Overall, a great choice for a compact space. One customer review after another says that it’s a solid, quick-heating, well-built grill, good value for the excellent price! Are you looking for a gas grill you can take with you to the beach, camping, picnics, or pretty much anywhere? This portable gas grill is one of the best ones out there right now. With a compact shape but decent size grill area, fold up sturdy size shelves, and ergonomic handles, you’ll love taking this one with you on the go! The Q2200 is one of the Q series of Webers – they look similar to each other in shape and style. The differences are in the size of the grilling area, the BTUs, and a few small extra bonus features that some have, and others don’t. This particular grill is our top pick in the Q series as it combines a nice size (280 sq inches) with great power (12,000 BTUs on one stainless steel burner). It also has awesome ratings and reviews! A fully assembled grill right out of the box! All you need to do is attach a 14.1 or 16.4 oz LP cylinder (sold separately), flick the electronic ignition system, and let it heat up! The grates are split down the middle so if you’d like, you can order a Q2000 compatible griddle grate and use your grill as a griddle as well! It’s made of serious grill materials: porcelain-enameled cast-iron cooking grates and cast aluminum lid and body – it’s no cheap-o portable grill that will only last you one summer! We think you can’t do better than this grill if you are looking for a decent sized portable gas grill. 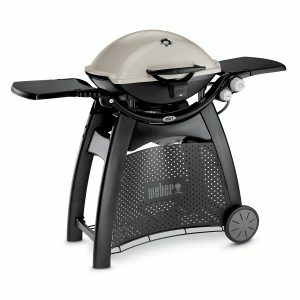 You’re getting Weber quality (which is tops… look at how many Weber grills ended up in this Best Of list), and a great price! The Weber Genesis II S-310 is one of our favorites in this “Best Gas Grills” list – it combines quality, nice features, and great price all in one! Weber is simply a name you can trust when it comes to grills, and the Genesis II design is one of their more popular lines. This particular model comes in your choice of Natural Gas or LP (liquid propane) fueled, and also in your choice of black painted steel or stainless steel (pictured). Going the black painted steel route can save you about $100, and you’ll still get the side shelves and handle bar in stainless! 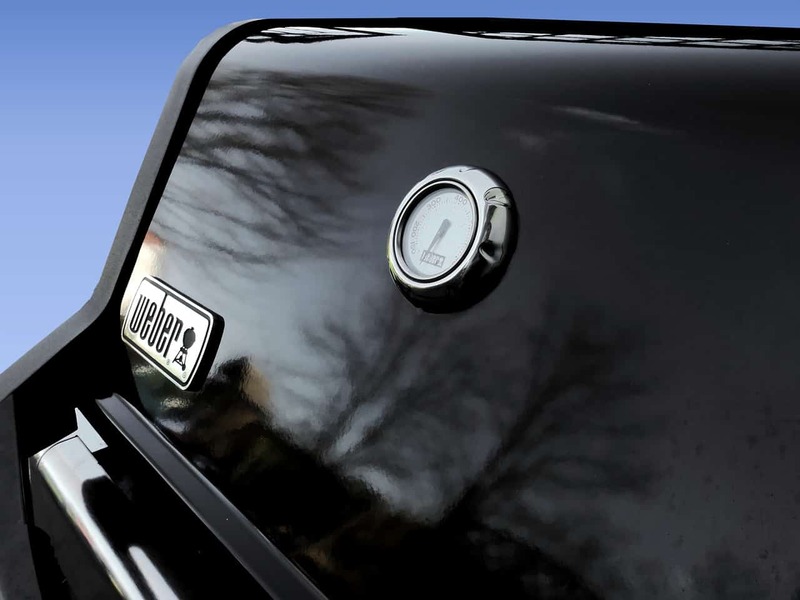 The new Weber Grease Management System that minimizes flare-ups and makes cleaning your grill simple! Open Cart Design: You can use the bottom shelf for your tools and accessories, keeping your patio nicely organized! And if you go with the LP version, the propane tank remains hidden in the solid metal piece on the right side. The tank rests secured on a metal hook with a weight-gauge that lets you know how much fuel is left in your tank. The 2 large stainless steel prep tables have integrated hooks for your utensils! You’ll love having a dedicated spot for your tools, especially when they are “dirty” with food grease and juices! Porcelain enameled cast iron cooking grates that nicely season, sear, and cook evenly! The grate is large enough to cook for a small crowd! You’ll get 513 square inches of cooking space along with 156 square inches of tuck-away warming rack overhead! We also think you techies out there will love this grill as it is iGrill3 ready! It’s not included, but you can add this digital Bluetooth grill thermometer and monitor your food from your smartphone! One last note about this grill is for you dog owners… the “Open Cart Design” means no doors to protect the drippings pan from your hungry dog! You may find you don’t appreciate this… however your dog will probably love it! If you’re looking for a gas grill for yourself and maybe your small family, or if you want a grill that won’t take up much space on your patio, the Weber Q3200 is fantastic choice. It’s not portable (detachable from the cart) like others in Q series, but you’ll love the look and shape! Of the Q series, it’s the only grill that you can order in either Natural Gas or Liquid Propane fuel! If you’re looking at the Natural Gas option, you’ll be happy to know that it comes with the natural gas hook up hose! The grill cooking area is 393 sq inches, and sets out 21,700 BTUs, which is impressive for a grill this size! Even though this grill is a smaller size (and with the side shelves that fold down, it’s footprint can be even smaller), it’s still made of top quality materials, including porcelain-enameled cast-iron cooking grates and a cast aluminum lid and body. The cart is made of glass-reinforced nylon, and it comes with 2 handy wheels for easy portability. If you want to go the Natural Gas route, it comes with the gas hook up hose – you won’t need to buy that separately, just hook up the included one to your gas source! It has an Infinite Control Burner, which lets you set the grill to a certain temperature and trust that it’ll stay that temperature! The grate is split in 2, and you can replace (at extra cost) one of the grates with a special griddle grate! Imagine using your grill for breakfast, lunch, and dinner! Handy special extras: It comes with a grill-out light on the handle that helps you grill outside in the dark, a built-in thermometer, and 3 utensil hooks, and a spot to stow away the included warming rack! 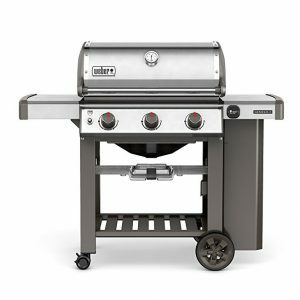 Weber grills in general are known to be top quality (note all of the Weber options on this Best Gas Grills 2019 post) – and this one is no different. We think you’ll love it! If you’re looking for a high quality larger size grill, this 4 burner option from Weber comes with lots fun extras! It’s a serious grill for serious grillers! Whether you choose the natural gas model or the liquid propane model, and select the painted black steel or stainless steel look, we think you’ll be as thrilled with this gas grill as the many product reviewers who gave it such a high rating! 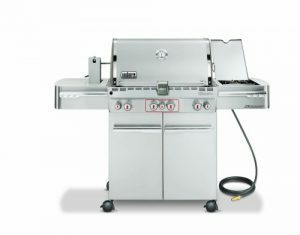 It comes with Weber’s new GS4 grilling system: stainless steel flavorizer bars that capture the dripping grease and turn it into infusing smoke, the Infinity ignition system that ensures a perfect start every time, high heat stainless steel burners, and an unparalleled grease management system! The SIZE of this grill – it’s HUGE! Your grilling area is 646 sq inches, PLUS the 198 sq in. tuck-away warming rack! The grill grates are made of 7mm stainless steel, which is top quality! Some people do prefer cast iron grates, but stainless steel ones are considered top quality – they retain their heat extremely well, and last forever, looking like new! 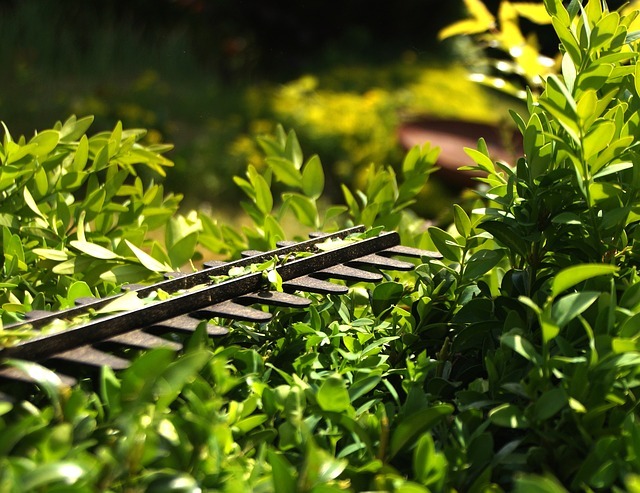 Plus, stainless steel grates require almost NO cleaning – just a quick brush off! It has some fun extras that make grilling a great experience, not just a cooking session: a flush mounted side burner for making sauces and side dishes, utensil hooks to keep your station neat, lighted handle bar & control knobs, wheels that lock, is iGrill3 ready (Bluetooth thermometer app you can purchase separately), LED fuel gauge (LP models), and more! Overall, if you are looking for a grill this size, and want something top quality and long-lasting, the Weber Genesis S-440 is one of the grills you need to be looking at! Next we look at one of the best grills on the lower end of the budget. We think you serious grillers who want either a smaller or cheaper option will be really pleased with what this 2-burner grill by Char-Broil has to offer! It’s a liquid propane grill only – those who are looking for a natural gas grill should keep going, unless they want to purchase a fairly simple-to-install natural gas conversion kit (sold separately). Yes, it’s also a cheaper looking grill than the some of the above (those Weber’s with all the stainless steel and painted steel are pretty sleek, aren’t they), but you do get what you pay for. And yet, it’s still a good enough grill to make it’s way solidly into the best gas grills for 2018. The burners are top-ported 443 stainless steel tube burners, which put out high Infrared heat and even temperature control. Infrared burners heat up faster and maintain more even heat better than many traditional burners. And with the Infrared technology comes a special barrier grate that sits between the cooking grates and the burners, capturing all grease and drippings (making flare-ups history and seriously flavorful/juicier meat)! 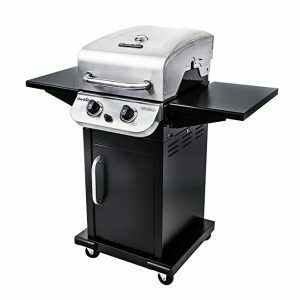 The grill sits on 4 casters (2 have locks), so you can move it around with ease! It comes with an enclosed storage cabinet for your propane gas tank but there’s also room for grilling tools, sauces, rubs, brushes, and more! For a solid grill that heats up quickly, stays hot, grills up flavorful and juicy food without the nasty grease flare-ups, we declare this grill one of the best! This grill, developed by Weber in 2013, was “Amazon’s Choice” for best natural gas grill for 2017 – it stayed popular in 2018, and will likely be just as great in 2019! It’s a perfect size grill for a small family or couple! This isn’t an overly fancy natural gas grill, but it does have everything you need to cook great tasting, juicy food! In standard Weber style, it is built from high quality stainless steel and black painted steel, and has a clean, sleek look that’ll be a great addition to your backyard patio! Porcelain-enameled cast iron cooking grates – cast iron seasons well, retains heat, and clean very easily! The cooking area at 424 sq inches (plus warming rack) is big enough to cook a small (20lb) turkey or do meats and veggies at the same time! SS flavorizer bars, that capture the grease drippings and turn them into smoke that infuses your meat with flavor AND keeps your grill clean! This grill is also on heavy duty casters, so you can move your grill around the deck safely if you want to… perhaps you need more room for one of these fantastic outdoor games for adults? Or perhaps you need to store it away in the winter season. Either way, you can lock it in place or move it at will. 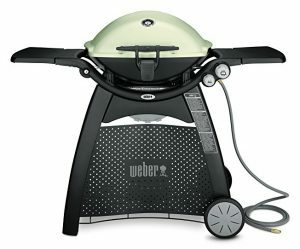 For a grill under $500, you can’t top this Weber Spirit E310! We think it’s a great choice for anyone who wants a good quality, long lasting, budget friendly grill! Thinking of making a bit of an investment into a grill that has pretty much everything (INCLUDING ROTISSERIE), a grill that will be “the last grill you’ll need to buy”? This Weber Summit is one such grill, available in liquid propane or natural gas options. The Summit Line is Weber’s “crown jewels” – if you want the best, these are they! This grill is nice and big! The cooking area is It claims to be able to cook for 8-10 people with ease, and because it has the handy side burner (12,000 BTUs on that burner alone), you can cook your full meal at the grill with ease! One of the things you’ll love on this grill is the full rotisserie system! It comes with a flip-up motor and separate spit and fork, has storage in the enclosed cart, and can be tucked completely away out of the way when you aren’t using it! This grill includes all of the standard awesome Weber goods and then some! This grill certainly has it all! Check out this video for some extra details! Once again, Weber adds another sleek and stylish, top quality grill to our “Best Of” list. This particular model, the Genesis II E-410, is one of the few that comes in a variety of colors (Black, Red, Copper, and Smoke), and also in either Natural Gas or Liquid Propane, so you can really customize to make it exactly to suit you! The Genesis II E-410 is a large grill, able to cook enough to feed a crowd! It has one of the largest grilling areas of any of the grills featured here, coming in at 646 square inches (then add a 198 square inch tuck away warming rack). It’ll be great for cooking complicated meals that require various settings (steaks on one side, veggie kabobs on the other? ), or for foods that are best cooked via indirect heat. As you can see in the pic here, this grill has the open cart design. The Natural Gas model is pictured – the LP model has a steel shield of sorts on the right side under the shelf that hides the propane tank from view. The open cart shelves design is great for easy grease tray removal, for storage of grilling tools, and more! The GS4 grilling system (SS Flavorizer Bars, 4 SS high quality burners, Weber’s improved Grease Management System, and the Infinity Ignition that guarantees an easy light up each time). It has a fuel gauge on the LP models, so you’ll never run out of propane mid cooking! While this grill doesn’t have a ton of bells and whistles (no handle lights, no rotisserie, no side burner…), if the large grilling area size and top quality burners/grates are what’s most important to you, this grill is one you shouldn’t pass up! 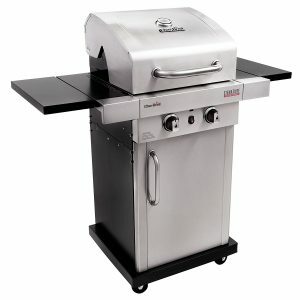 This is a smaller grill, and perfect for those who are looking for a simple grill that performs consistently well. It’s about half the size of the above grill (cooking area 360 sq inches), and has SS 2 burners for you to control the heat. Although it’s small, it’s still built of top quality materials and has the sleek and stylish look that will add elegance to your back patio. It’s currently the Amazon’s Choice product for “Weber Grill Natural Gas” – meaning they consider it an excellent product that’s exceptionally priced and able to ship immediately. It comes with the 10′ connector hose to connect the grill to your natural gas source. You can fold down the side prep tables to minimize your grill’s footprint if needed (which makes this grill perfect for small patios). It can reach temperatures of 500-550 degrees Fahrenheit (great sears) and yet the handle doesn’t get unbearably hot! It is made from porcelain-enameled, cast-iron cooking grates (no seasoning required, easy to clean) and has porcelain-enameled Flavorizer bars that convert drippings into flavorizing smoke and protect your burners. There are 6 utensil hooks built into the sides of the prep tables that help you keep your grilling area organized and clean. 4 heavy duty castors (2 that lock) allow you to move your grill with ease. This is one of the lower budget gas grills that we are pretty impressed with, as you get top Weber quality in a compact size. Want to see more about it? 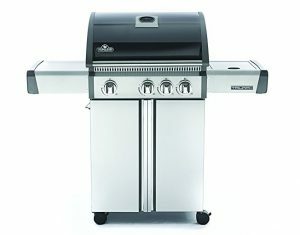 This grill has over 1,500 reviews at the time of writing, and it maintains a surprisingly high average – meaning a lot of very satisfied customers. With the low price, the many features you get, and the quality materials, it’s no surprise! This Char-Broil 4-burner gas grill (Liquid Propane only) is a large grill – 480 sq inches of cooking space – lots of room to cook for a crowd! You can control the heat very nicely with the four knobs, cooking with direct or indirect heat, and ignition is never an issue with the Electronic Ignition system! It has a built in thermometer so you can instantly tell how your grill is performing, heat-wise. There’s a nice panel that hides an unsightly propane tank, keeping the grill looking stylish on your patio! The grill has a stainless steel lid, handle, control panel, and fascia – SS always adds style and durability to your gas grill! 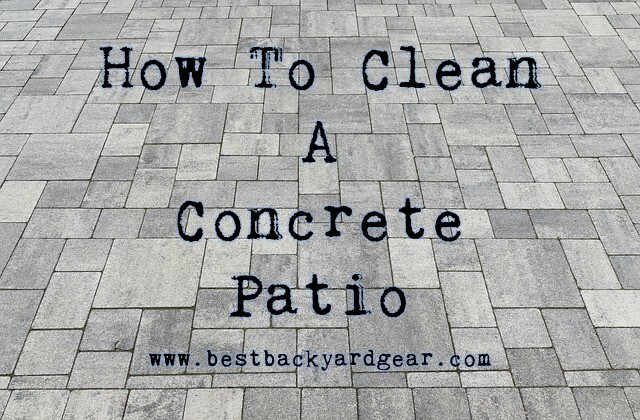 The porcelain coated grates are easy to clean and cook evenly. While this grill is worthy of being in the top 15 gas grills list, be aware that it is a cheaper grill, and you do get what you pay for. Do not count on having the grill grates last more than a few years as reviewers do say that rust is an issue. But that’s what you get for an approx. $200 grill. Overall, it’s a solid option if you want a large grill that’ll cook great food and is easy to assemble! Enjoy Grilling With A Gas Grill This Year! 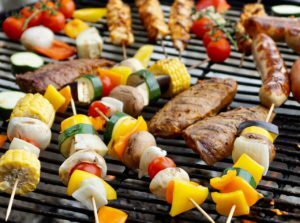 Whether you chose a natural gas grill or a liquid propane grill, whether you go with large or small, cheaper or expensive, it’s our hope that you thoroughly enjoy your grilling time with whatever gas grill you go with! Overall, we recommend going somewhere in the middle price range if you can afford it. While a cheaper model can be a great gas grill, you won’t get as many years out of it as the grills made from higher quality materials. The gas grills on this list do cover a wide variety of options and prices. It’s our hope that you were able to find exactly what you were looking for! Uncertain yet? 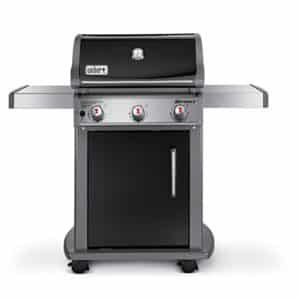 Check out our Top Rated Gas Grills Features Comparison Chart to guide you further. Interested in something a bit different, perhaps? Learn all about pellet grill smoking or check out our “Best Pellet Grills” post. Feel free to drop us some feedback or questions below and we’ll be happy to get back to you asap! Happy grilling! It’s the first day of summer and doing bbq in the backyard or in campings will be tons of fun. Thanks for this very comprehensive review of these grills. My family is actually in need of another bbq grill since the last one that we used got very old and rusty already. 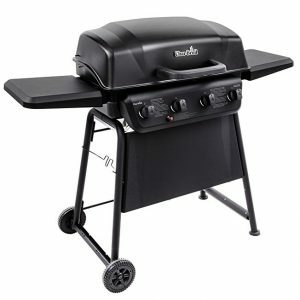 For me, the Char-Broil Classic 405 4-Burner Gas Grill is my choice because it is cheap, spacious, and the wheels are a bonus for easy mobility. Nice post. Very timely as well. Thanks Marita for stopping by and commenting! We love grilling at our place too – yes, there’s just something about firing up the grill that screams “Summer time”, isn’t there? I like your pick, and I think you’ll be happy with the Char-Broil. Happy grilling! We have an apartment with a built in charcoal grill outside. I wish we could have gas – but I definitely enjoy using a gas grill in my friend’s backyard. I’ve been considering getting a better grill for tailgating and camping – other than using what’s already available with charcoal. The Weber 54060001 Q2200 Grill looks like a good fit for that. Do you know if the cylinders for the gas are sold online? I know I’d have to go get it filled. I have that exact grill! We take our Weber Q2200 camping and to the beach or park for picnics, so honestly, I can tell you that it’s a fantastic grill… you’ll love it! My wife and I had other portable gas grills (we prefer gas to charcoal), but this one is WAY better than any we’ve had. wow, this is a GREAT review on gas grills! Except that I purchased one about 10 years ago and found out I much prefer a charcoal grill. For some reason, the flavor of food is better (i think). I’ve always had the best luck with Weber, so I keep returning to it. Have you done a review on charcoal grills because i’m in the market for one now! Thanks Jackie, glad you found the review helpful. Yes, Weber grills are definitely top notch – you pretty much can’t go wrong picking a Weber if you’re unfamiliar with gas grills. Sorry, but I haven’t covered charcoal grills yet. I do plan to at some point, but I must say, I am of the opposite opinion to you… I don’t care for the flavor of charcoal-grilled meat! I know lots of people who swear by it though, so I think I’m in the minority! Have a great summer, and thanks for writing in! I like the looks of bull outdoor and it seems like it has a sturdy construction. The area is very large it is actually 100 sq inches larger than my current one. However how is the quality price ration of it? The price seems a bit high for me. However if it is worth the money I will buy it. Hi Furkan, I think when it comes to the Bull grill, you’ve basically got a high quality grill in all areas – it’s not just size, it’s the quality of all of the pieces put together that make it stand out. I’ve generally found over my many years of gas grilling that I can count on personally about $60 per year. So a $300 grill will last me about 5 years. The Bull is one of those grills that last much, much longer than 5 years – you do get what you pay for. I am happy that I bumped into your site. 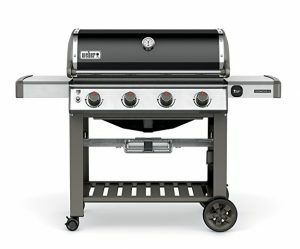 I have been looking for a grill that isn’t too big, or has to many extras that I will never use, and I think I found it here. I pass the rows of them going into my local hardware store and end up leaving because it is so hard to make up my mind about all of the available options, but you helped me make a decision with your great information. Thanks. Awesome, Candace, glad to be of service! I too find it overwhelming looking at a big collection of grills at Home Depot or somewhere like that… they all look sort of the same to me then! Hope you enjoy the one you picked out! Happy grilling! And thanks for taking the time to connect! It’s time for us to get a new gas grill before the Summer comes to an end. Weber 54060001 Q2200 Grill is my pick!! Great pick, Alejandra!! If your husband is anything like me, he will love that grill… we have that same one, and it’s great! You’re right that not everyone needs a huge grill. You just need a GOOD grill, and Weber gas grills are definitely good grills. Happy grilling, and thanks for writing in!